Many arm exercises look simple, but looks can be deceiving. Sure, it seems like you just pick up a dumbbell and curl the damned thing, or do the same with a barbell or cables. In reality, however, arm training is a bit more technical than that—if you want to get the most out of your time in the gym, that is. I could tell you which exercises to do and then leave you to fend for yourself, but that’s not my style. 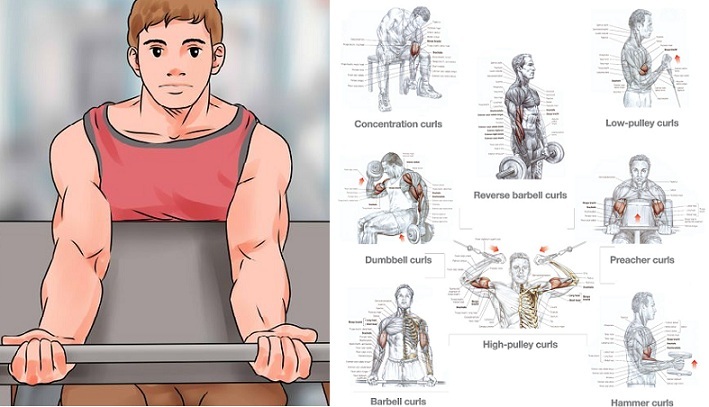 I want to help you get massive arms by showing you really simple tweaks to classic arm exercises that will help you maximally stimulate your biceps and triceps. More stimulation, activation, and challenge will lead to more growth. Get ready to clang, bang, and get bigger—these easy hacks will make all the difference during your next arm workout! The secret sauce to making this timeless biceps exercise particularly appetising is a little hand rotation. It seems like such a small thing, but if you concentrate on internally and externally rotating your hand during the curl, you’ll ensure that you’re really stretching and working the muscle. Instead of pumping straight up and down, start this move with the dumbbells at your sides and your palms facing your body. 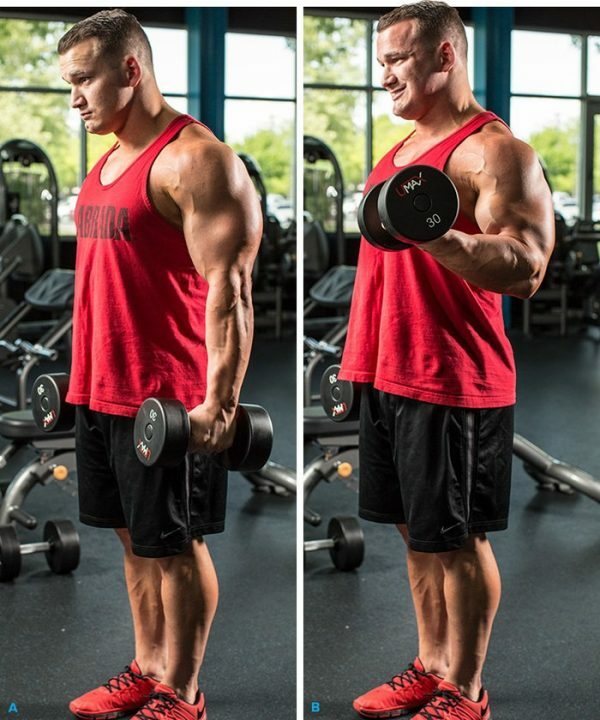 As you begin a rep and raise the dumbbell, rotate your palm outward so that it faces the ceiling and the dumbbell ends up positioned horizontally. 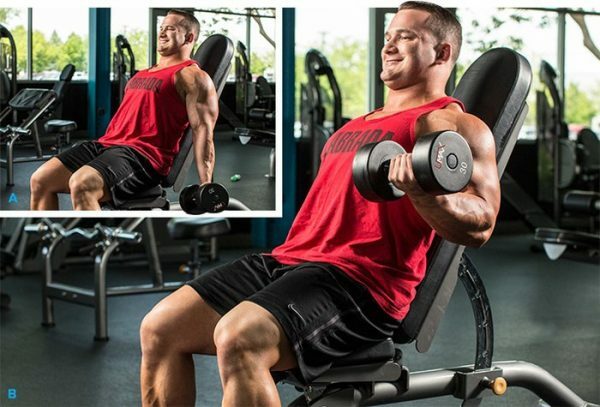 This simple rotation maximally recruits your biceps muscle fibres to give you a better contraction and a pump like you’ve never felt before. After lowering the dumbbell in a controlled manner, rotate your palm back toward your body to the starting position and curl the dumbbell in the other arm in the same manner. While the barbell curl is another classic arm exercise, most people don’t know this game-changing tip of simply keeping your shoulders back. In fact, when performing all biceps movements, you want your shoulder blades back and retracted, as if you were pulling them toward the ground. Doing so helps isolate the biceps and keeps all of the motion at the elbow joint. 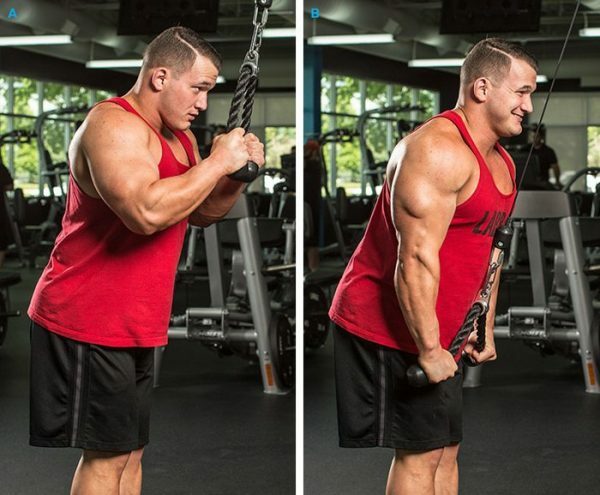 This keeps your front delts, back, and chest from unintentionally assisting in the exercise. After all, the goal is to place the stress from the barbell curl primarily on the biceps, not the rest of your body. The adjustable incline bench introduces variation to the standard dumbbell biceps curl and changes the angle of attack on the biceps. 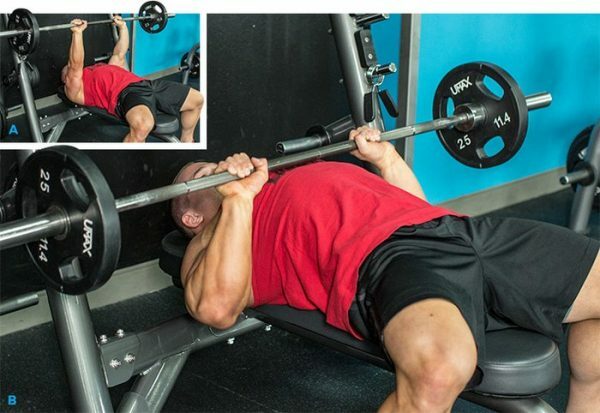 Take the incline bench from a full 90-degree angle and drop it one or two notches down. When you sit back down, the key here is to again keep your shoulders back and against the bench to isolate the biceps. As you fatigue, you may feel the body’s tendency to lean forward and utilise the chest and front delts, but this isn’t an exercise for those muscles. Retract your shoulder blades and pin those elbows to your sides as you perform this exercise to work the intended muscle. 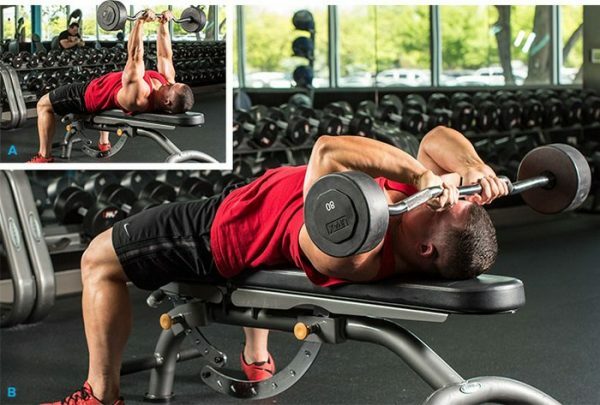 Additionally, most people may do a hammer curl, but I like to do the standard biceps curl and get a better contraction from this angle on the bench. The skull crusher is a tried-and-true triceps-targeted exercise you can perform with either a barbell or dumbbells. I see a lot of folks flare their elbows out as they perform each rep, which ends up placing a lot of stress on the elbow joint and connecting tendons—basically on areas other than the triceps. Keep your elbows steady and pointed toward your legs. The only motion occurring from this exercise should stem from the elbow joint, allowing your triceps to contract and work. Avoid locking out at the elbow at the top of the rep in order to keep constant tension on the triceps. Kick-backs are designed to isolate your triceps, but the little-known detail of internally rotating your hands—or turning them inward—as you reach the peak of the rep makes all the difference in your pump. It helps emphasise the outer head of the triceps, an oft-neglected portion of the muscle. Just like in the skull crusher, freeze the shoulder joint and pin the elbow to the side to allow for as little motion as possible from the upper section of the arm (the humerus)—only the elbow joint serves as the pivot point while the triceps are extended to “kick back” the dumbbell. Keep the motion slow and controlled, and feel the triceps working. Fix the rope attachment to a pulley machine and get ready to apply a simple external rotation to maximise contraction quality on this triceps exercise. But first, I cannot emphasise enough how important it is to keep your shoulders back and lock your elbows in position. As you pull the rope down with a neutral grip, turn your palms toward the ground so that your hands externally rotate, as if you were spreading the two ropes further apart. This places more stress on the triceps and lets you fully reap the benefits of this exercise. A close grip on the barbell bench press recruits more of your triceps than a wide grip, which is what we want. However, my main gripe when I see others doing this exercise is that they tend to grip the bar with their hands too closely together. This super-close distance only ends up placing undue stress on their wrists and shoulder joints, increasing their chance of injury. More importantly, they are no longer working out the triceps as they intended to! From your standard bench-press grip, bring the hands in just slightly. I use the end of the knurling (the rough part of the barbell) as a guide for placement of my index fingers. As for my final tip? You guessed it. Tuck those shoulders back and press them against the bench as you perform each rep!